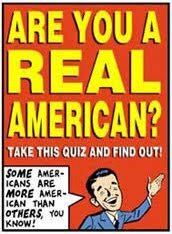 The Urban Politico: Real Americans? • Two-thirds of the 1,000 American adults polled couldn't name a single current justice, and just 1 percent were able to name all nine sitting justices. • More Americans could identify Michael Jackson as the composer of "Beat It" and "Billie Jean" than could identify the Bill of Rights as a body of amendments to the Constitution. • More than 50 percent of respondents attributed the quote "From each according to his ability to each according to his needs" to either Thomas Paine, George Washington or President Obama. The quote is from Karl Marx, author of "The Communist Manifesto." • More than a third did not know the century in which the American Revolution took place, and half of respondents believed that either the Civil War, the Emancipation Proclamation or the War of 1812 occurred before the American Revolution. • With a political movement now claiming the mantle of the Revolutionary-era Tea Party, more than half of respondents misidentified the outcome of the 18th-century agitation as a repeal of taxes, rather than as a key mobilization of popular resistance to British colonial rule. • A third mistakenly believed that the Bill of Rights does not guarantee a right to a trial by jury, while 40 percent mistakenly thought that it did secure the right to vote. • More than half misidentified the system of government established in the Constitution as a direct democracy, rather than a republic-a question that must be answered correctly by immigrants qualifying for U.S. citizenship. In a country where our national laws are crafted to give deference to whatever "the majority" of Americans want, given the fact that "the majority" of Americans do not know the basics about America, what does that say about the entire notion of "majority rule" in this country?